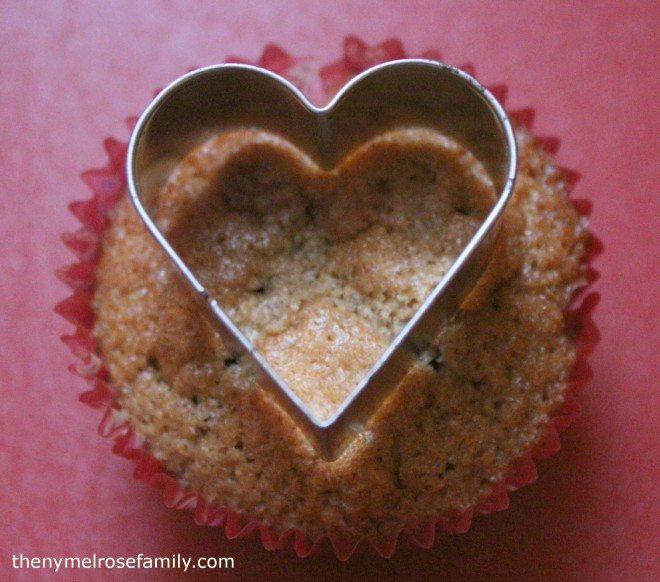 After creating my Apple Pie Cupcakes, I wanted to try something different for Valentine’s Day. I thought heart shaped cupcakes would work best, but couldn’t find an effective way to get the entire cupcake to take the shape of a heart. So instead I decided to create a heart shape within the cake of the cupcake. The flavor combinations of the raspberry with cinnamon glaze was just an extra kicker! I have a slight infatuation with cupcakes as you’ve seen from my Apple Pie, Blueberry Lemonade, Chocolate PB&J and Watermelon Cupcakes. I’d like to say that it’s because Riley loves them so much, but it’s largely my love for individualized pieces of cake. I love being able to pack up six cupcakes and send them with Riley to daycare with hopes that the kids will think I’m the greatest mom ever, even though I often don’t feel that way because I’m sending her to daycare rather than staying home with her. 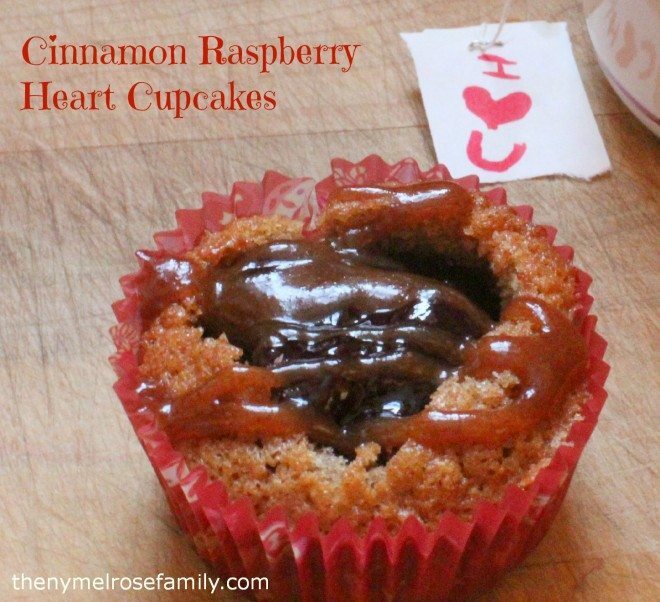 The day I made these Cinnamon Raspberry Heart Cupcakes I had my assistant to help me with them because of a snow day. Riley’s job was to push the heart cookie cutter into the center of the cupcake so that I could hollow out the heart shape in the cupcake. Once the cupcake was hollowed out I filled the inside with a teaspoon of raspberry jam. I quickly learned that it’s important not to go too deep with the cookie cutter because the cupcake will lose it’s shape and start to cave in. These cupcakes would have tasted great with the cinnamon cake and raspberry filling, but I went one step further by adding a cinnamon glaze. It could easily be omitted though. I drizzled the cinnamon glaze back and forth across the cupcake on some of them. For the last cupcake, I actually shaped the glaze around the heart. It came out cute and kept the shape of the heart better. 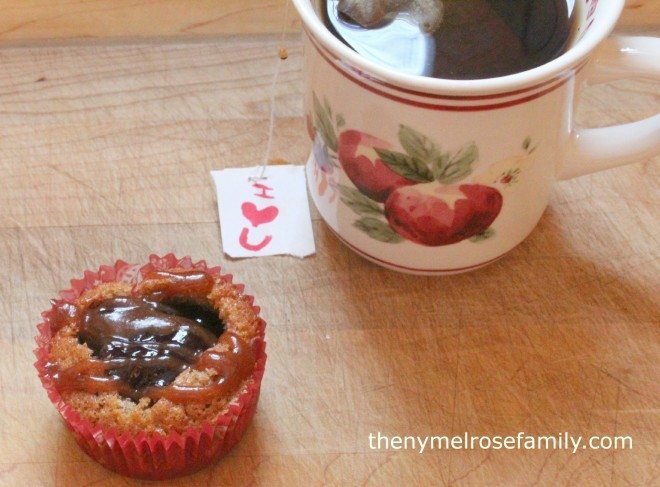 Either way these cupcakes were delicious and went great with a nice cup of warm tea. A cinnamon cake hollowed out in a heart shape and filled with raspberry jam and topped with a cinnamon glaze. Preheat oven to 350 F. Line cupcake pan with 12 liners. Stir together the flour, baking powder, cinnamon and set aside. Cream together the butter, sugar and vanilla extract. Add in each egg separately and beat for a minute. Add in the dry mixture (flour, baking powder and cinnamon) and milk by alternating the two when mixing it in. Pour the mixture into the lined cupcakes and cook for 20-25 minutes until a toothpick can be placed in the middle and come out clean. 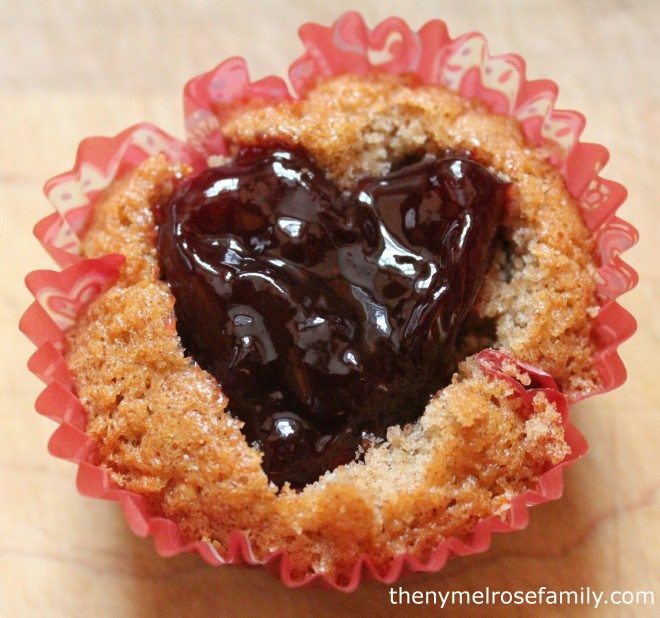 Let the cupcakes cool and then use a heart shaped cookie cutter to hollow out the cupcake and fill with a teaspoon full of raspberry jam. For the glaze heat the 3 tablespoons of butter, sugar, water and cinnamon in a saucepan until it begins to bubble. Oh that looks great, Jenny ! Oh these cupcakes look yummy! Awesome idea! Thanks so much Jamie for your sweet words. I love your site. The latest football hat is so cute! I hope you’ll stop by Whimsy Wednesdays to share it tomorrow night. Homa Style is having a Valentine link party going on now. I would love it if you linked up your Cinnamon heart cupcakes. These sound so good! Pinned it.